OK – just a quick reminder, ’cause we know that you already read it in the Newsletter, but it bears repeating: Please don’t park on Thompson Drive. Please drive SLOW on Saxon Hill Drive. Please keep your dog in control in the parking lot. Please don’t leave trash around, don’t make a ton of noise – let’s respect our neighbors! We DON’T want to lose this parking lot, or have the police sit there all the time waiting for people. Not worth it. So – What are we up to at Saxon? Saxon is one of the original mountain biking and multi-use areas we started taking care of. Hans Jenny and his band of friends over 11 years laid down most of Flow, Mo Flow, Low Flow, etc, along with many local volunteers at the time. The was the hay-day for what we now call ‘rake and ride’ trails. At Saxon the huge sand moraine desposited from the Wisconsin glacier let’s you literally rake the leaf litter and topsoil off so that you can ride on the subsoil layer. Some of our best flow trails are in the area. 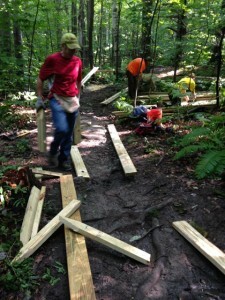 Thanks once again to the locals and pioneers who have been trail building and maintaining for years. Through the years many of the trails have been flooded out or eroded away by major storms. Sand erodes easily, and Saxon gets a lot riding when other networks are wet as the sand usually drains well. Also, Saxon is pretty near Burlington, so a lot of people use this network frequently. All these factors have added up to contribute to the deep troughs, mud holes, exposed large roots scattered all over, exposed rock sections, and trails that now hold water. Some sections are at the point where the damage is irreparable unless you bring in material and machinery, or bridge over a lot of the bad sections. Last year we laid down about 150 feet of boardwalk in the Low Flo area that was washed out by Irene. This year at the intersection of the large white pine tree to the right, we just finished 425 feet of what we call ‘roller coaster’ board walk. When making a boardwalk this long you need to constantly change the pitch, topography, and sight lines so users can successfully navigate the board walk. At the end we banked it up high so it will push you back onto the trail. We armored a large section at the beginning and end so the pressure from the bike tires doesn’t create a hole in that area. 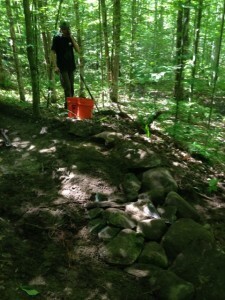 We then continued down the trail and performed our routine maintenance. 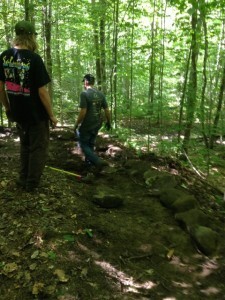 When these trails were built, we didn’t know as much about what makes a sustainable trail as we do now, especially with as many riders as we get on them. Issues like drainage, tire pressure impacts, and lasting construction weren’t big issues then because we had a lot fewer riders. That was just the time back then – the sand was so easy to build in, and the drainage seemed to be so good that we didn’t worry about it. It seems like it’s only the last five years that Saxon has been worn down to its current condition. We went through and looked for drainage issues. 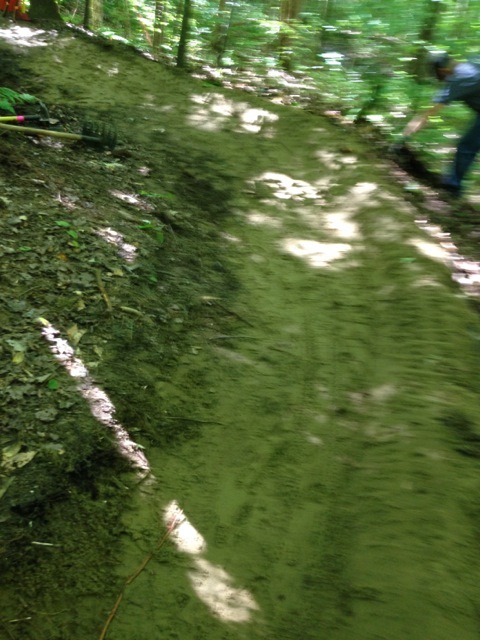 Every 20 feet of straight sections, if there wasn’t any drainage, we created drainage nicks, outsloped the trail, used tile drains, or re-routed the trail. 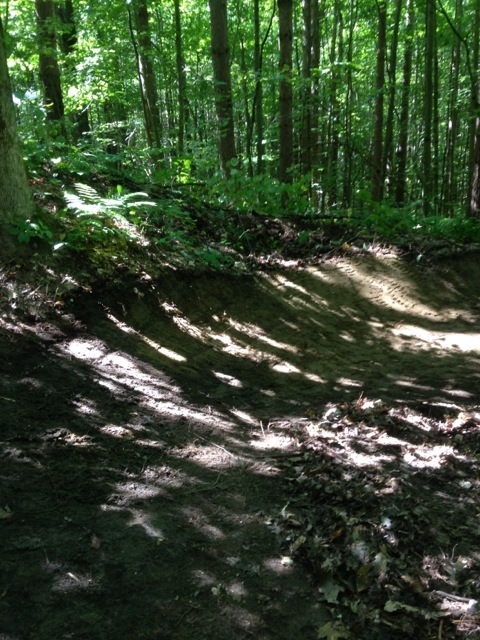 We also improved the berms. The best way to build a berm is to use rocks in the center as a spine, covered with subsoil, with a place for water to drain at the end or in the belly of the berm. 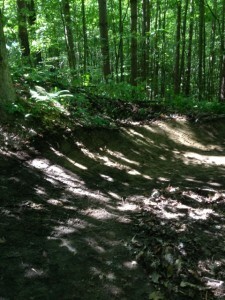 There are areas on Freefall where berms were built with rocks or logs at the back. 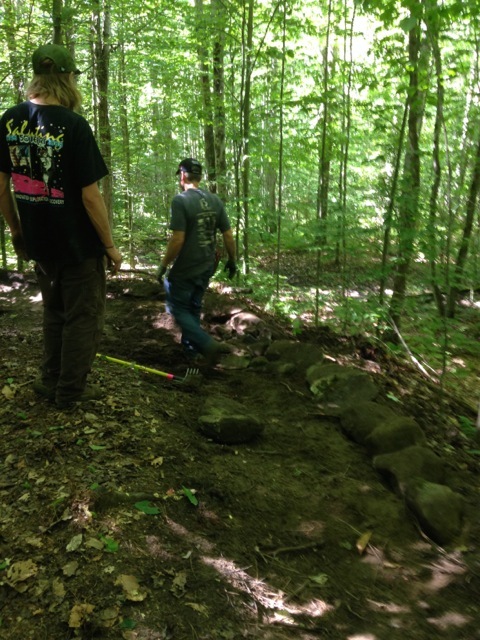 Eventually the soil covering them erodes away and they rocks or logs shift into the trail and the feature has to be re-built. So it’s really good to do it right the first time around, and that often means digging a borrow pit for more soil to lay over the spine. In Saxon there aren’t a ton of rocks laying around, so at times we need to use logs. Not the best material to use as they’ll rot, but it you can’t bring in material this is an OK last resort. We use fresh hardwood logs and they’ll usually last 5-7 years before you need to re-build or re-vamp the feature. 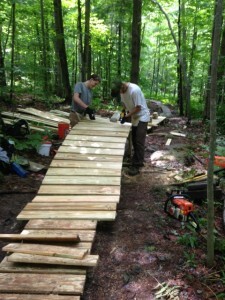 In all, we made built or renovated 12 berms below the new roller coaster board walk. The next two weeks we’ll be finishing the trail to the bottom with another board walk on the lower side that goes right through a drainage area. We’ll be re-routing part of it to cut out an area that is wet 75% of the time. 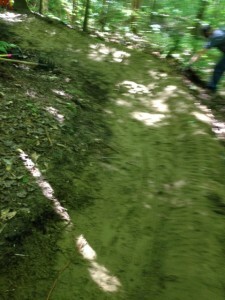 Enjoy the renovation, roller coaster, and the flow of the trail! A lot of this work is due to the fact that one day a group of rider went through and said to me, “You know, it’s just not as flowy as it used to be.” This really inspired us to get out there and put the flow back into Flo. Enjoy, and thanks for your support. Mickey Stone Trail Director, Fellowship of the Wheel.